I tried 2 varieties of Quaker's Warm & Crunchy Granola: Apple Cinnamon and Honey Almond. When you open the packets and try a nibble, you realize that this product is basically a pretty nice granola. The instructions are simple. Put the granola in a microwave-safe bowl, add 1/4 cup of milk and microwave for 25 seconds. Problem... after 25 seconds, very little of the milk gets absorbed. It looks like what it is... granola swimming in lukewarm milk. Solution... stir and microwave for 20 more seconds and you end up with the thick oatlmeal-like consistency shown on the box. Result... 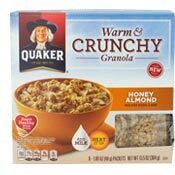 Warm & Crunchy Granola from Quaker is definately warm but not altogether crunchy. There's small pockets of crunch in any given spoonful, but it's more chewy than crunchy. That's not a bad thing. Since oatmeal and other hot cereal can be soupy, it's refreshing to have a hot cereal with substance that you actually chew a little. These hot cereals are little too dense. A splash of milk on each serving is the perfect way to thin it out just enough to make the texture work. 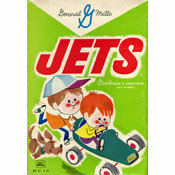 Of the two, I preferred Honey Almond the best. The flavors in that one are more associated with granola. The apples and cinnamon variety has a the same flavor profile as Quaker's Apples and Cinnamon Oatmeal, leading to a mouth confusion that says, "Whoa... what's going on with my oatmeal." Overall, I kind of liked this product. It feels like a fancy oatmeal. I don't think they've perfected it yet. If it had quicker milk absorption and left more crunch, it would be much better. If you try it and don't care for it, just eat the granola straight from the packet. It's pretty good like that too. For my money, the better Quaker product right now is any of their instant oatmeal packets - cooked and topped with a handful of any decent granola. What do you think of Warm & Crunchy Granola? I want it too. Loved it! Can't find it anywhere! 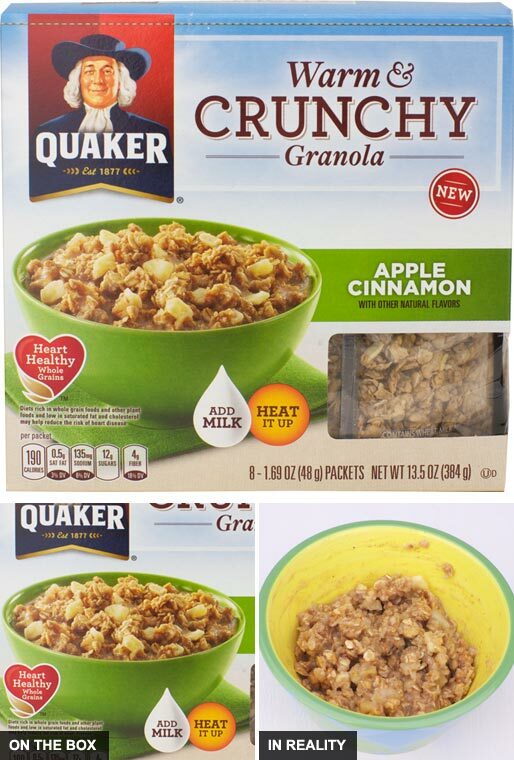 I love Apple cinnamon - I cannot eat oatmeal so I thought this was just as good. The problem is I cannot find it in the stores anymore. I went to six stores, no one has it. I hope it's not off the market. I love this stuff!! I keep 2 in my purse at all times as a snack, eat it as is. No milk or microwave required!! I love this granola! I pour in some milk and microwave for 1 minute. You can make it as you like. Problem is that I can't find it in the grocery stores right now. This reviewer obviously prefers oatmeal, and is dissing on granola because it isn't oatmeal. Prepared as is the 1/4 cup of milk is perfect. The instructions also state to add more or less for desired consistency. It is basically a clustered cold cereal, but prepared hot like oatmeal. And there are no big chunks and nuts like in a box of clustered cereal. It's smooth like oatmeal, but with the crunch of granola. I don't like oatmeal, but I love this stuff. Brought this into work, and only then did I read the panel: "MUST be prepared with milk". But I have no milk here; I'm concerned that any other prep w/out milk will be tragic. ;) I bet this is why I found it at Jewel for $2.00. The "milk ultimatum message" is on the side of the package in very small font. Needs to be more prominent for guys like me. Otherwise I enjoy Quaker. Delicious but really more like a desert than a breakfast food, with 12g of sugar. I like it prepared just as it says. If you do as the reviewer says and microwave it longer, that's what makes it lose its crunch. I added an extra five seconds just to get it nice and hot, and there is still some great chewy and crunch texture, with great flavor of apple and cinnamon. Is this oatmeal really healthy? It has a lot of carbs. 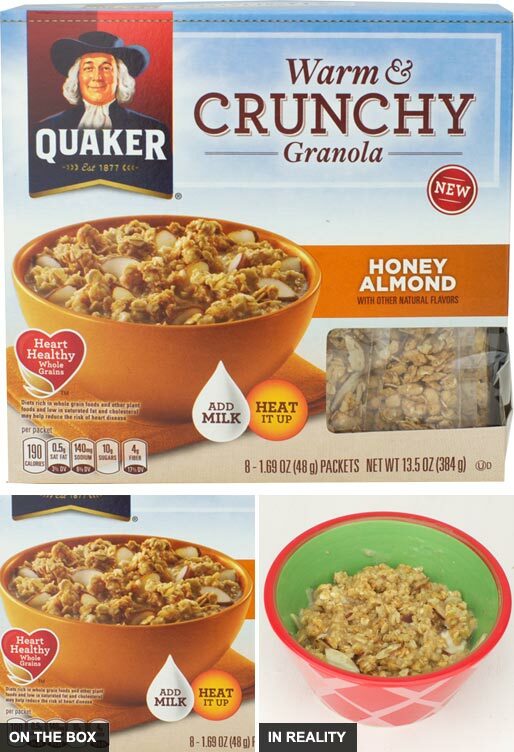 I think it is great made with the amount of milk on the box, but I use unsweetened vanilla almond milk. It seems to stick with me pretty well. I love, love, love this product! I've tried all 3 brands and the very best one is the honey almond. I use 2 packs with about a 1/4 cup of milk, sometimes a little more but it gives it a nice creamy texture with a nice crunch. I'm highly addicted to this crap. Yea I know,I need help but it's just that good. I mis-measured the milk and just ate it cold... pretty good. When I did it right (cooked as directed), more flavors came out. Either way, it is perfectly acceptable... also good as a snack but pricey if you go that route. No don't add more milk and microwave it longer. It's supposed to be like that. Tastes great.